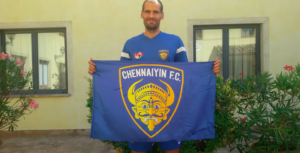 Italian defender Alessandro Potenza has become the latest signing for Chennaiyin FC in this year’s ISL, joining the squad for the 2015 season. Potenza, 31, was officially confirmed as having has joined the Chennaiyin squad’s pre-season camp in Italy. Chennaiyin FC, who finished top of the inaugural Indian Super League season in 2014, continue to build their defensive capabilities with Potenza joining the likes of Brazilians Eder Moneteiro Fernandes and Mailson Alves. Potenza spent his youth career in the Inter Milan youth system, followed by senior spells at Italian sides Fiorentina and Catania. Chennaiyin coach Italian Marco Materazzi is said to be pleased with the signing, and expecting a strong influence from the Italian in the 2015 season.